The best and most cost effective solution for decreasing maintenance costs is an effective entrance matting system. A well designed entrance system plays a vital role in providing a safe, clean and attractive entrance way and environment. The best and most cost effective solution for decreasing maintenance costs is an effective entrance matting system. Vloer Commercial Flooring Systems Entrance Defense can be a 1,2 or 3 part system; performance is ranked by the number of zones utilized. 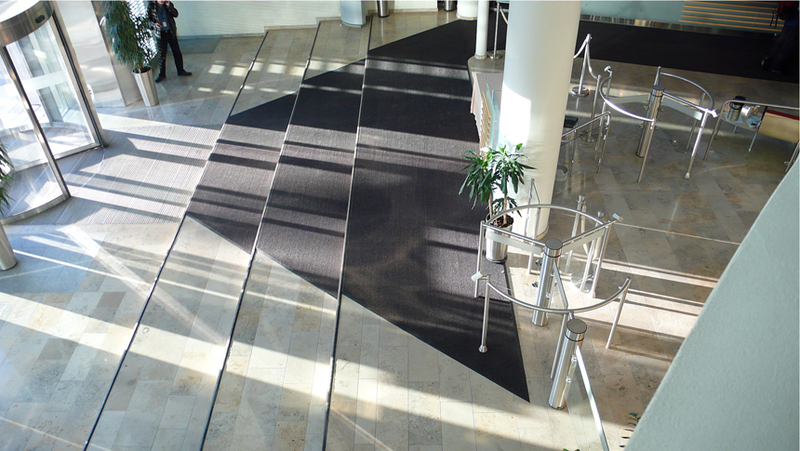 A single mat achieves good results, but a three-part entrance matting system achieves superior performance. According to TRSA research, within commercial buildings more than 80% of the dust, dirt and grime is tracked in from the outside via footwear. this tracked in soil effects not only the appearance of interiors but also the quality of air. Outside & Inside: Cleans & Absorbs Moisture. TRSA studies also show that one square yard of commercial carpeting can accumulate a pound of dirt per week and up to two pounds during wet weather. Inside: Absorbs Moisture & Dries. We suggest along with commercial flooring experts that a minimum of 5 to 6 steps or 18 linear feet from Zone 1 to Zone 3 is required for a zone system to effectively keep dirt out. By using any one of our walk-off products you will lower your maintenance costs, achieve better air quality and have a safer building by reducing the opportunity of slip-fall accidents. Let Vloer Commercial Flooring Systems floor covering experts customize your entrance way.